Resting deep inside the depth of the woods, there exists a community, very rare to come out of the cocoon. What’s that? The Aborigine. In Peninsular Malaysia alone, the community of Orang Asli can be subclustered into three categories namely Semang, Senoi, and Proto-Malay. If we explore the case further, the life of orang Asli is mostly unique. 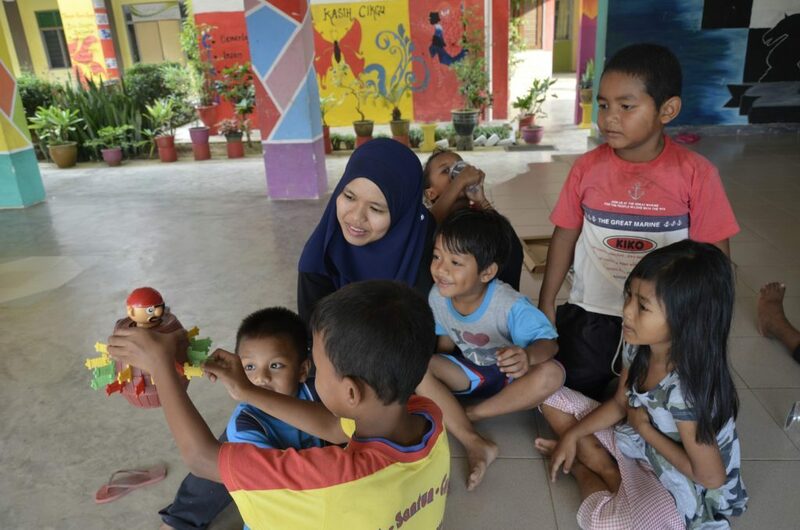 Farah Amirah Sarifuddin, one of the staff at Islamic Relief Malaysia (IRM) enjoys the nature of works with Orang Asli in her possession when she was in-charge to be placed at Kampung Orang Asli Buluh Nipis, Pahang. Just like the other wide-ranging communities in Malaysia, these Aborigine families also have their own structures of family and public society. They are also entitled to get the access to education, just like the children who attend schools every day. Also, if there is a headman in a village, Orang Asli communities too, have their own leader that should be acknowledged. Apart from that, they work on a daily basis, hold to one faith, involve in societies, and also play sports. What isolates them from us is that, they live far away inside the place we rarely know, far-flung from the public. Kampung Buluh Nipis is located in Muadzam Shah, Pahang, about 26 Kilometers away from the city centre. According to Farah itself, she stayed in the Orang Asli community to fulfill her duty as part of the organisation’s programme, Community Development Programme which focuses on sectors such as education, infrastructure, health, and sustainable livelihood. Nevertheless, the presence of Farah in the community is absolutely not all about work and job tasks alone. There is a multitude of key takeaways that she felt to understand better the life of Orang Asli. “I grabbed the chance and made the decision to stay in the community with them in the first place. Alhamdulillah, they are all so friendly and feel comfortable when I’m around. “To be frank, weeks of staying there are too short for me to maintain good relationship with the people in the community, I believe it applies at all places as well. But among the things that I need to highlight, when we engage in the community of Orang Asli, they are all still the same, they treat us as human beings and even welcome our presence at their place. When questioned about the uniqueness of Orang Asli, Farah believes that their survival ability is far more advanced and they also possess creativity level which is beyond a normal person can think. “They possess the ability to invent, create, build, and apply whatever that comes in their way to carry on their life journey. The most obvious thing I have ever seen was at the village, the art of what they built in their house. The house is walled by bamboo and roofed by leaves of palm tree. Besides, I have also seen pupils invented a replica of bomb toy using sticks and papers. In spite of their incapacity to purchase materials or equipment for themselves, even food on a daily remains a doubt, it is these factors which intensify their survival ability and even far greater as compared with most of us, the modern communities residing in metropolitan. Additionally, having stunted from the state-of-art enables them to improve their imagination ability and creativity at a level which a normal person rarely possesses. Among the best moments which Farah enjoyed with Orang Asli is the appreciation and care shown by the community itself. “I am indeed so delighted that the children including mothers in the community remember me during my presence. They always call me by my name when I am around. They way they appreciate me by waiting for my arrival at their place is considered a satisfaction that could never be obtained anywhere,” said Farah when asked. Speaking of the challenges for this isolated community is a whole new story. Based on Farah’s observation, Orang Asli are mostly not exposed to new technologies invented as in line with modern times. They have no idea what happens outside their village. Such condition has hardly made them to think outside the box to see the world on the other side. In academic achievement, the pupils are still lacking behind to perform well as they cannot afford to follow the syllabus. This is all due to the fact that they carry out different lifestyle which can be considered odd from the public community. But of course, it is unfair to describe they are lacking behind in everything. In fact, we are strictly not allowed to act as if we are ‘Mr-know-it-all’ and intend to make drastic changes in their community. There is one thing we should be aware of, Orang Asli do not want outsiders to disturb their identity and lifestyle. Better, take times and try to understand their locality before attaining their trust. To Farah, there is too much to learn when being around in Orang Asli community because it indirectly exposes a clear example that challenges faced by these people should be made a benchmark to be grateful for the things we are given today.